February 1940. 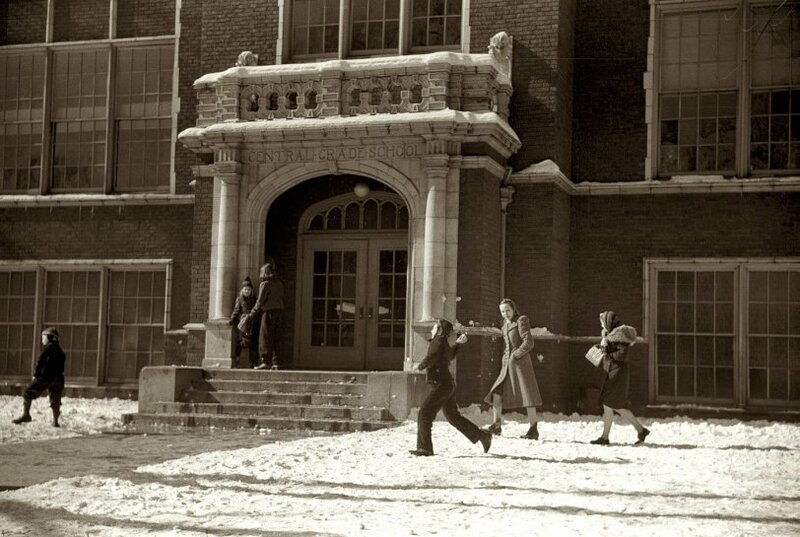 The snowballs fly at Central Grade School in Chillicothe, Ohio. View full size. 35mm nitrate negative by Arthur Rothstein for the FSA. Submitted by jlansford on Tue, 03/20/2018 - 4:59pm. From what I know this photo is of the former building Central School. Indeed, the building no longer exists and a newer building was built on the grounds, it was called Central School also and the front of the building faced 5th Street. The last I knew, as I no longer live in Chillicothe, was that this building is no longer used as a school,( my children went there for elementary education) but was being used as an adjunct space for the local library, which is on the same grounds. Worthington Grade school is/was in another part of town. Not sure of its current status and name. Submitted by ErikS on Sun, 12/30/2007 - 3:21pm. ...Guess I'm too young to remember! According to my parents, when we moved to Chillicothe (1974) the building was still there, but was then torn down and a new school building constructed on the same site (West Fifth near Paint Street). Worthington is another school entirely. Submitted by ErikS on Sat, 12/29/2007 - 12:44am. Is this "Central Grade School" now known as Worthington Elementary? I think so, but the photograph doesn't show enough of the building for me to say for sure.